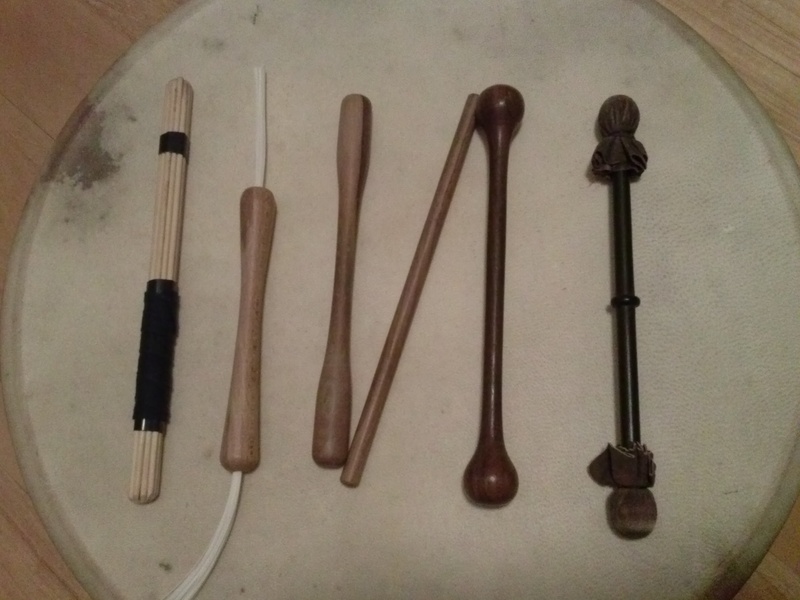 A few months ago I asked the bodhran community to send me photos of their tipper collections, big or small. The goal was simply to share our mutual passion for bodhran and possibly even enlighten others about tippers from around the world. I figured I’d get a good response, but I didn’t anticipate quite so many entries so I’ve had to break the album down into parts to showcase the collections best. So, here it is, Part 1 of the ‘Tippers Of The World’ album. If you’ve sent me your photo, but don’t see it here yet don’t worry. It will be featured in an upcoming release. Enjoy the wealth of information shared here, but please don’t feel like you need to rush out and buy twenty new tippers. Many of the larger collections have grown over the years, but all you need is one really good tipper to get started. With that said, if you’re looking for a new tipper I suspect these collections and accompanying descriptions will be extremely helpful. 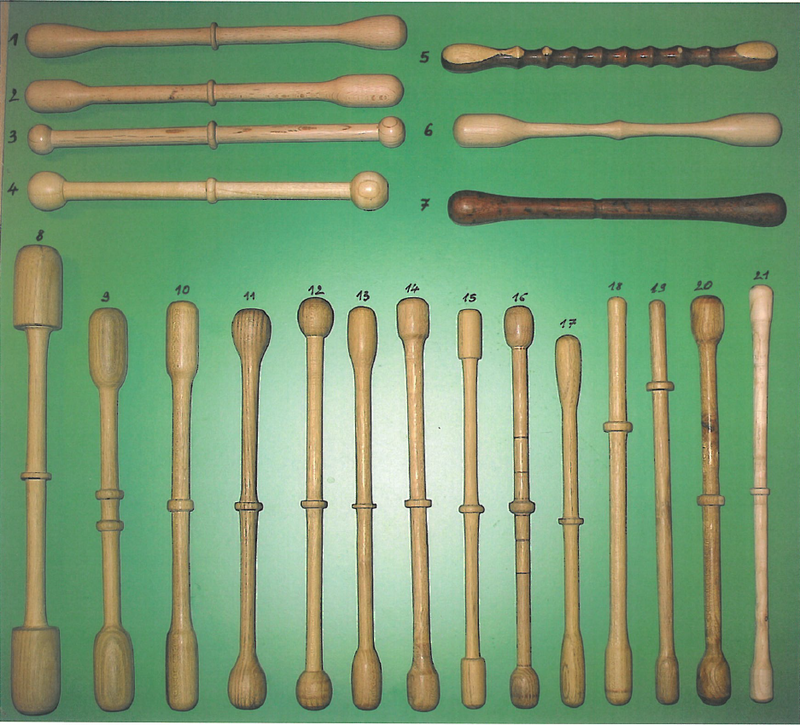 ‘Half’n’Half’ hotrod – bamboo skewers with four 3/16th dowels. 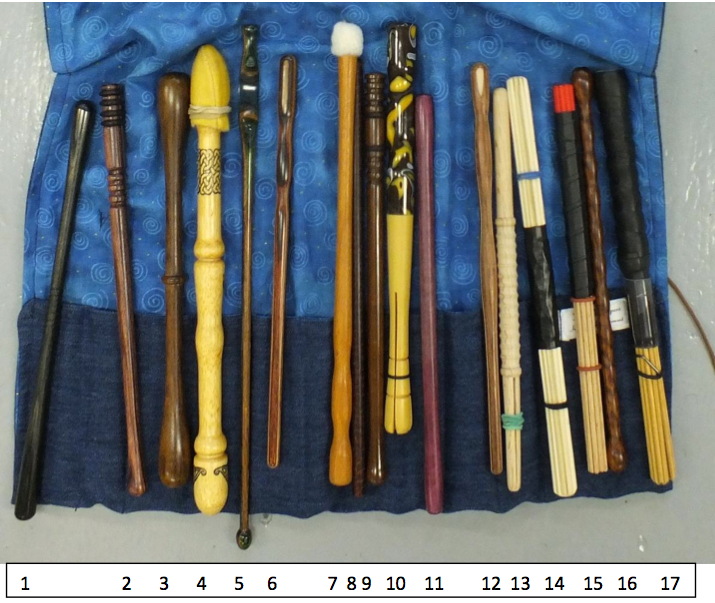 Ebony drumstick style (Falconwood Tippers) – custom-made, a cross between the Robbie Walsh and Colm Phelan Signature models. Hammer brass insert tipper in cocobolo wood (Whistle and Drum) – great for slow reels, hornpipes, marches where you need to give a real punch. Ebony tipper (eBay purchase) Hand turned by a chap in N.Ireland. Weighty tipper, sounds great on my Vignoles 18″. Pear-drop tipper. Came with my first non-tunable Waltons, but has a nice balance. Much better than most starter tippers. Bell/ball tipper. Came with my used Vignoles. Nice weight and balance. Wood stick. Used for left-hand accompanying beats. My favorite is the brush tipper as I can use this as a brush only or by changing the angle slightly I can have a tipper w/o brush and can alternate during a tune w/o changing tippers. I like the tippers with center or offset grooves for playing fast jigs and reels as I can get a good grip on the tipper. The tipper from Cas is nice and light and great for triplets. The ebony is good for 2am when everyone is loud so the drum has to be loud also ! Its a very heavy tipper though so does tend to fatigue the wrist after a bit. Glenn Stout tipper is small and light for soft playing I have added some fabric to some of the tippers to soften the tone. Hello Michelle, here is my tipper collection. Ball ended 23cm long bodhran tipper. My name is Georges VASSEUR, I live in France and I like celtic music very well. 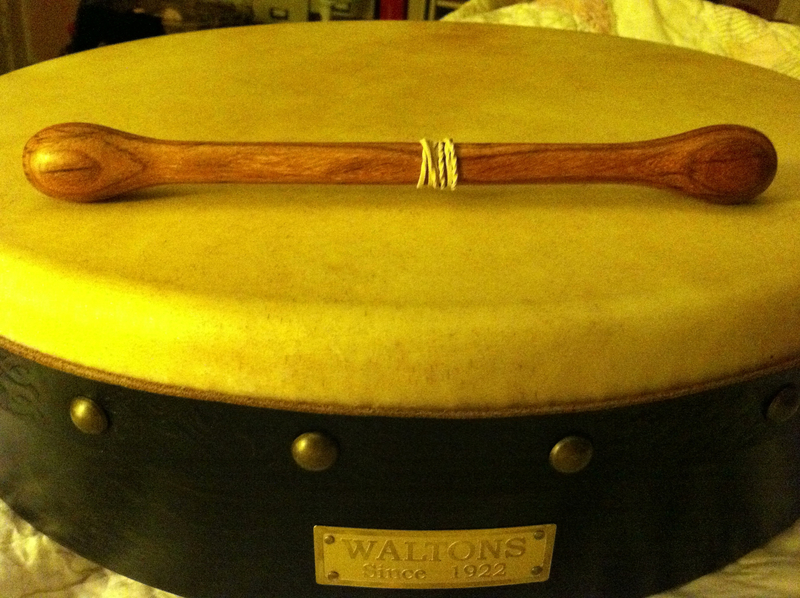 In 2012, I was for 10 days in Irland where I bought a Waltons bodhran and I’ve learned to play with it. 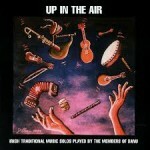 Later I bought a secondhand bodhran “Brendan White” and I play with it almost every day for 20 minutes. Now I’ve begun to make myself tippers and it’s very funny. I send here a photo from my tippers with them I play. 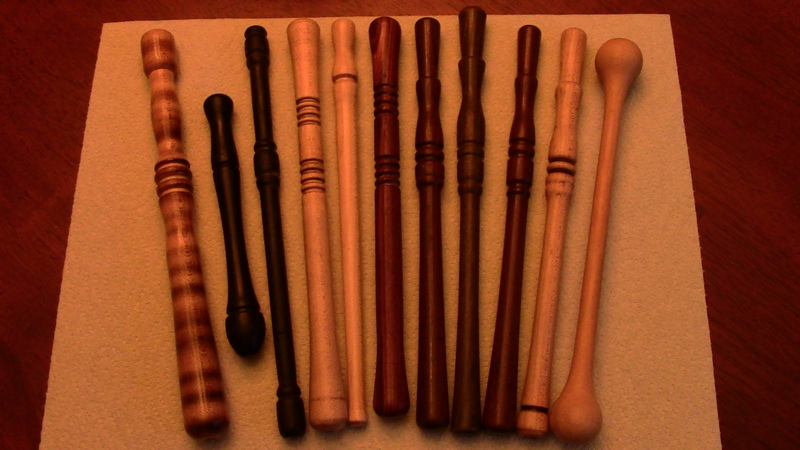 Most of my tippers are made from cocoa bolo wood. The next two really skinny lads are my speed demon reel tippers. The string bean one was actually made for John Joe Kelly by Jim Hunter and was my second child. John Joe has one of these. I got the second one made. Ray made the one with the bell end. The next two are split tippers, both made by the good Doctor. The darker of the two is split on one end. 10. & 11. 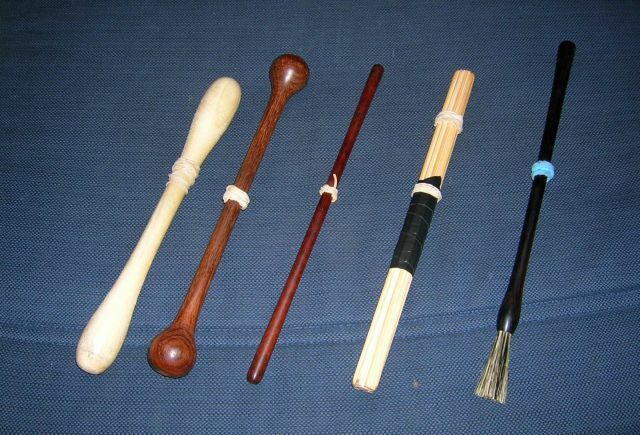 The last three are my brushes for the softer side, or if play to jazz (which happens more often than you think). All my brushes where made again by the good Doctor. The bristles are from a push broom. 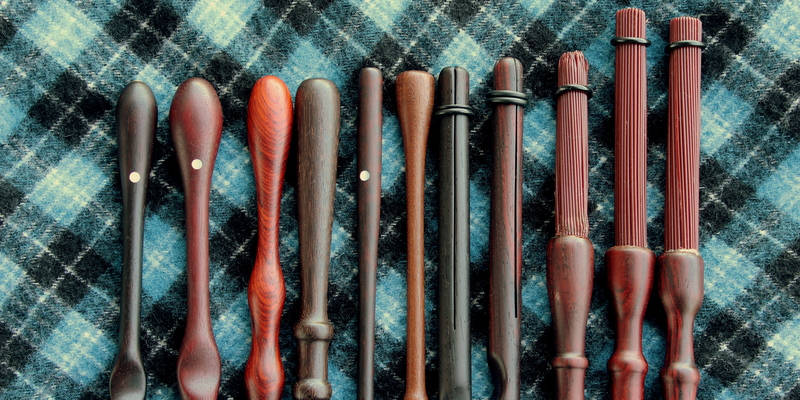 The rubber on the end change the sound and protect the bristles when traveling. All my Hunter tippers come with a mother-of-pearl inlay. Well that’s the kids, hope this helps. Take care Michelle. Dayly tipper#1, made from snakewood by a french flute maker, Louis Jourdan. One end is covered with a felt pad. Amazing sound. Standard drummer brush, great sound, hard on the wrist. Not on the picture. Can’t find it. this one is (was?) made of light-yellow boxwood, lathen by a wood-plate maker that I met quite by chance at a rock festival. We talked about bodhrans and he tried to make one for the first time… and it was a crack one ! CLICK HERE TO CHECK OUT PART 2 NOW! Stay tuned. Lots more great collections coming soon . 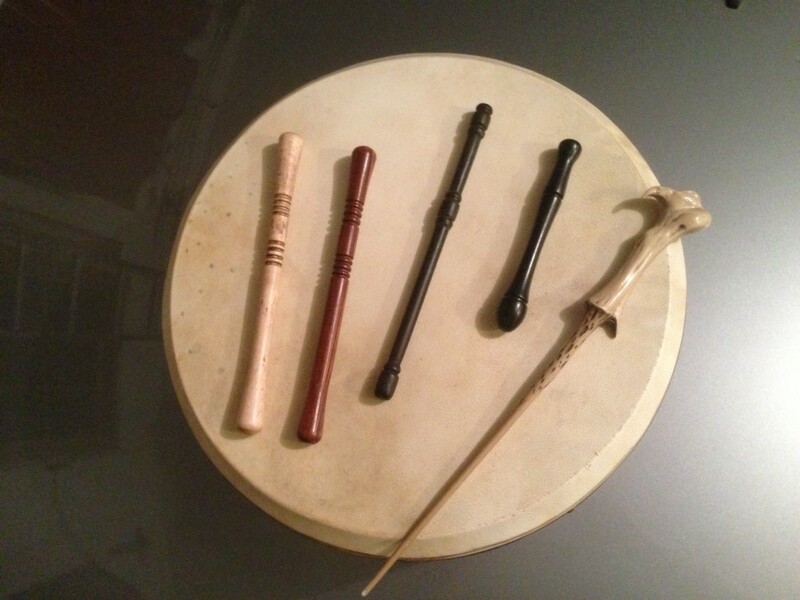 . .
(Aug 2012) Check out the other half of my friend Lauraileen’s bodhran tipper collection that she brought to the Gaelic College this year. It was certainly fun playing around with them. I wish I could have seen my own face when I tried number 10. It’s not just incredibly cool to look at either. It sounds like nothing else I’ve ever tried before so I’ll definitely be ordering myself one of those funky little numbers. In fact, I think I’ll start making up my bodhran tipper Christmas wish list and conveniently leave it where my husband is sure to see it. If you haven’t seen the first half of the collection yet click here. AND, as always, I love it when you share info about your tippers, where you got them and your own tipper stories. It’s a great help to everyone else who is thinking about investing in some new tippers too. The posts left under Part 1 (1st Half Of the Collection) were super so thanks to everyone who took the time to contribute there. Please leave a comment below to add your two cents on tippers and feel free to click the Facebook ‘recommend’ or Twitter ‘tweet this’ buttons to share this post with your bodhran playing friends. Keep calm and drum on. 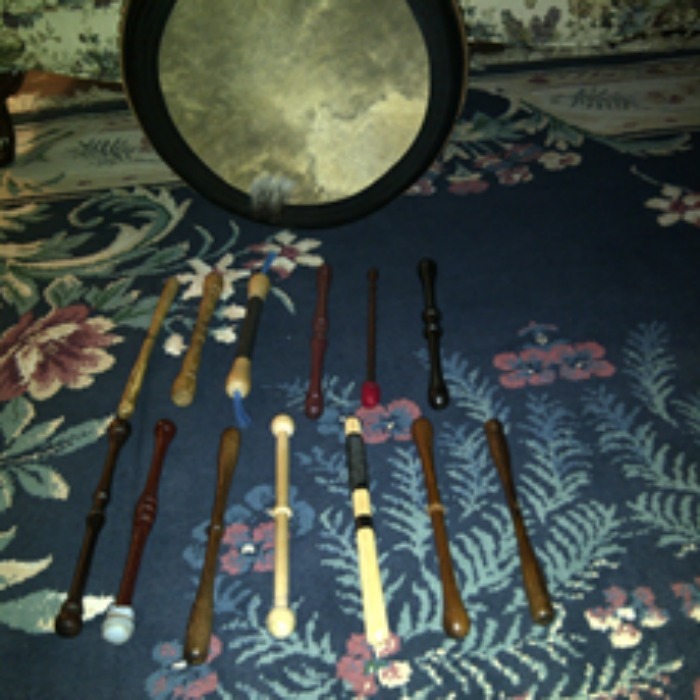 I’m in the process of gathering some of my students’ favorite bodhran videos for you to listen to and learn from as well as playing along with. 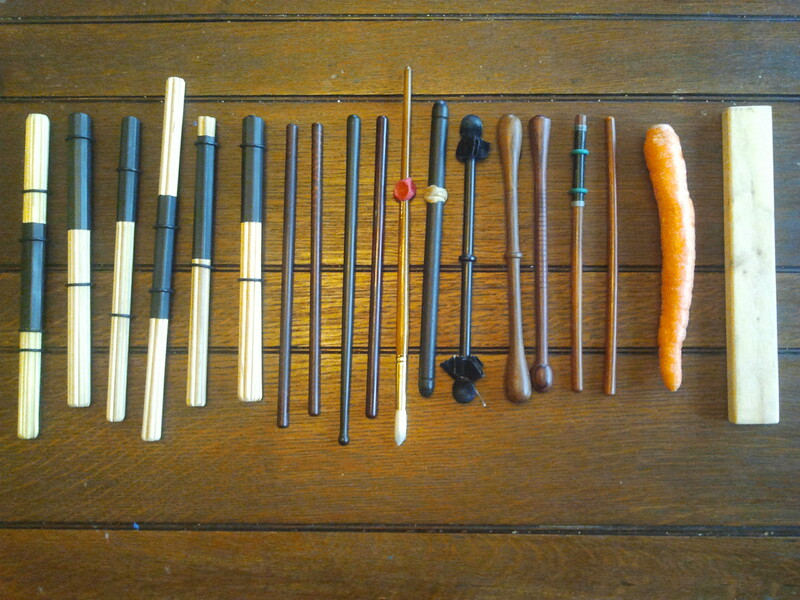 So, no more excuses for not knowing what to practice during your 10 Minutes A Day Practice Challenge. I’ll be posting more videos here on a regular basis so please send me the link to any of your own favourites in the comment section below. You know I love to hear from you so feel free to leave a comment about any of the videos or how you’re doing in your bodhran journey. Moving Hearts – Live In Dublin – The Lark on MUZU.TV. Tommy Hayes demonstrates his Bodhran Technique with and without beater. This video is one that inspired many to learn bodhran so it’s only appropriate to post it here. 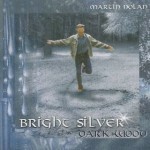 Some truly amazing bodhran playing by Martin O’Neill. I’m here at my mum’s place on the Bras d’Or Lakes in Cape Breton, Nova Scotia and it’s just been a cracker of a day. 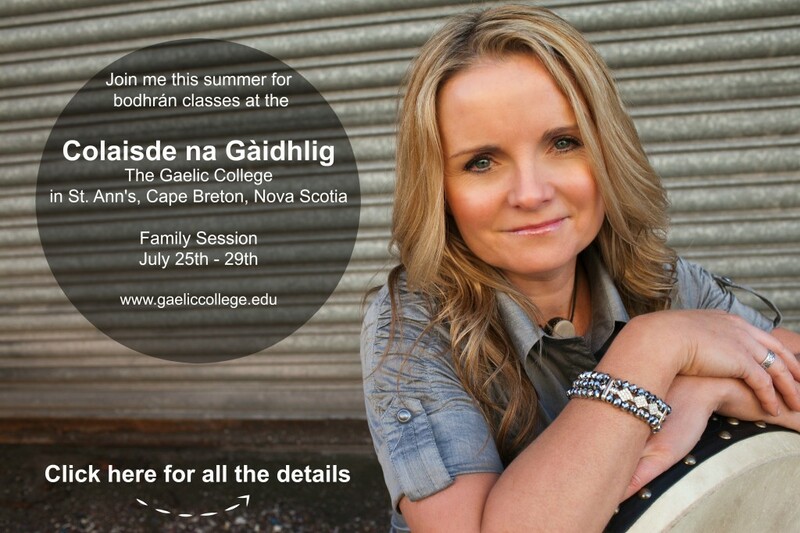 I’m into my second week of teaching bodhran at the Gaelic College and I was so inspired after an awesome day of lessons and ‘a-ha’ moments that I found some time to get my fiddle out to practice tonight. I have to tell you though, I’m not great on fiddle yet, but I’m getting better with instruction from my amazing teacher, Dara MacDonald. 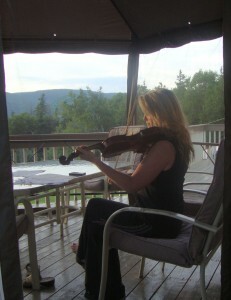 When I’m in Scotland Dara gets up at 6 a.m. Nova Scotia time to give me a Skype fiddle lesson at 10 a.m. Scotland time. I’m really grateful she does because she then goes off to teach a full day of school followed by more Skype lessons at night. 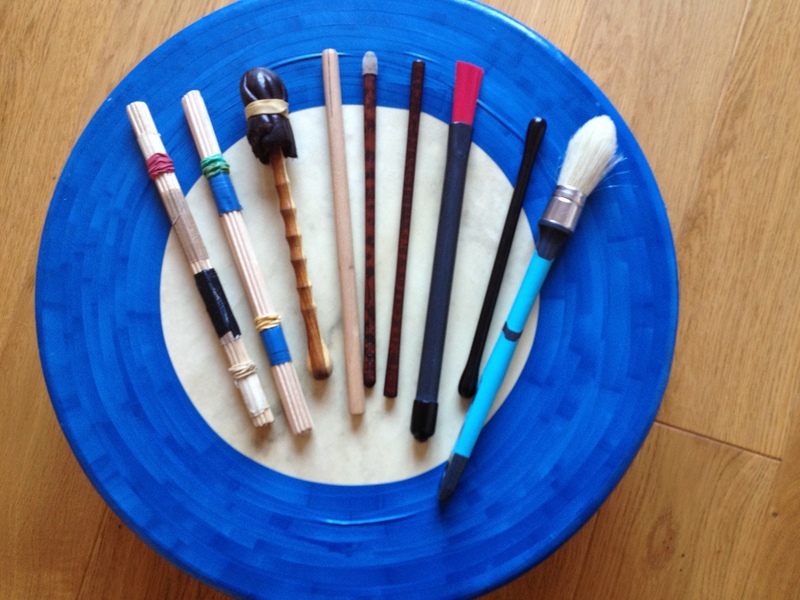 I am writing this to tell any of you who are thinking about learning a musical instrument, whether it’s bodhran, fiddle or whatever you’re passionate about, and you’ve been looking for a teacher in your area, that there’s never been a better time to learn. You don’t need to have someone in person, locally, to teach you anymore so there’s NO EXECUSES. I can personally vouch for Skype or video lessons. It’s an amazing gift to give to yourself. I turned 40 this year and this is one of the things that I’m giving to myself. I’ve always wanted to play the fiddle, and for years I’ve just been transferring over pipe tunes I knew and hit a plateau where I taught myself all I could. I definitely needed help if I wanted to get better. I know I probably won’t ever get to the point of recording a fiddle cd or anything like that, but I just get so much joy out of playing it and I love the music. I admit, I don’t really get alot of time to practice, but it fills me up. So, if you’re like me, and there’s something you’ve always wanted to learn, I want to tell you that you are NEVER TOO OLD and it’s NEVER TOO LATE to learn. Life is too short to not do the things you want to do. Click here to join the Plat family today and go completely at your own pace. Platinum Level 2 is coming soon. 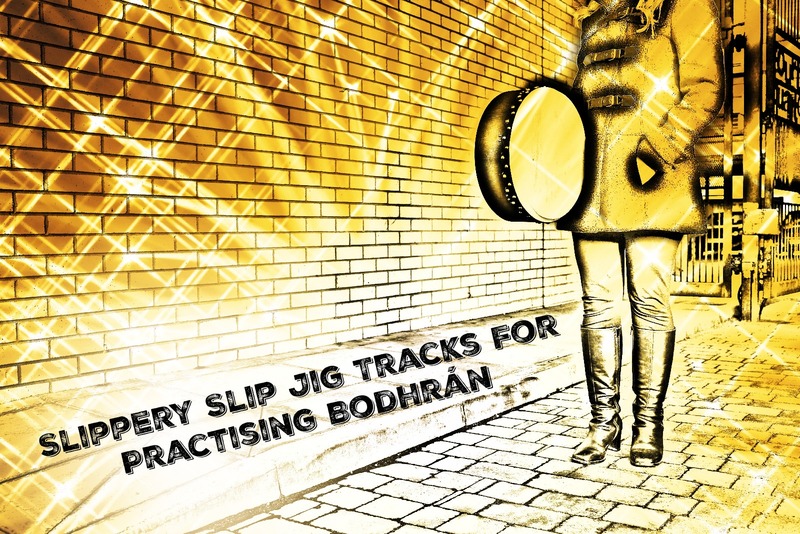 Slip jigs (9/8) are one of my favourite tune types to play on the bodhrán, but many who are new to them can find it difficult to tell the difference between 9/8 and 6/8 jigs. The best solution for this is to listen to lots of great tracks to get more familiar with them. 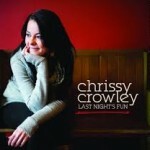 However, many album tracks don’t specify if the tune is 9/8 (slip) or 6/8 jig. 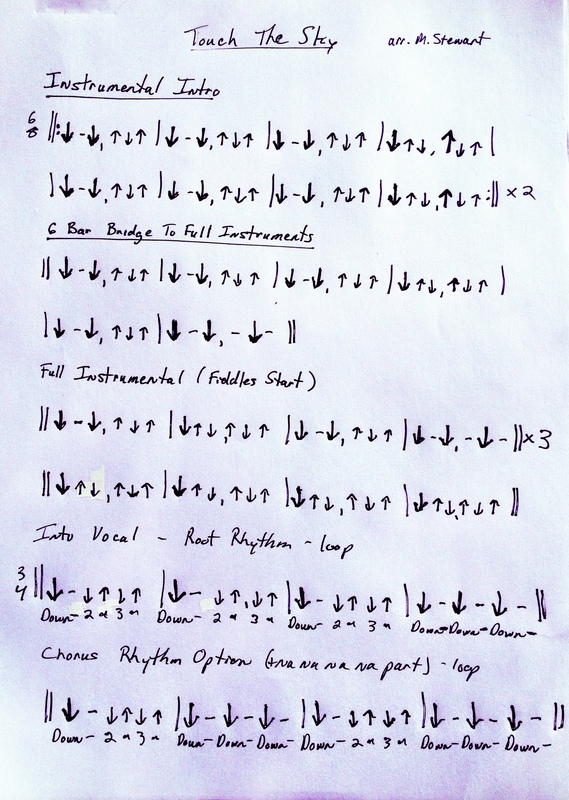 What makes deciphering the difference even trickier is the fact that many artists are known to play around with arrangements by adding extra beats, taking some out, or changing back and forth between time signatures. So be warned, a track may say ‘xyz Slip Jig’, but it might not be played in 9/8 straight through, or even played in 9/8 time at all. As fun as it is for those of us who can easily hear time changes, it can make it quite confusing for someone trying to figure out whether it’s a slip jig or not. In an attempt to help you broaden your understanding of slip jigs I have created a Resource List to guide you along some great tracks. It’s kind of like Slip Jig Listening School. 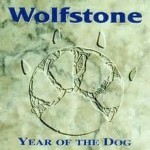 For each album I’ll recommend a track to practice along with and point out if and where the tune changes timing. Those of you confident with your slip jigs – you’re going to eat these tracks right up, especially when a few of them cross over to 5/4 time. 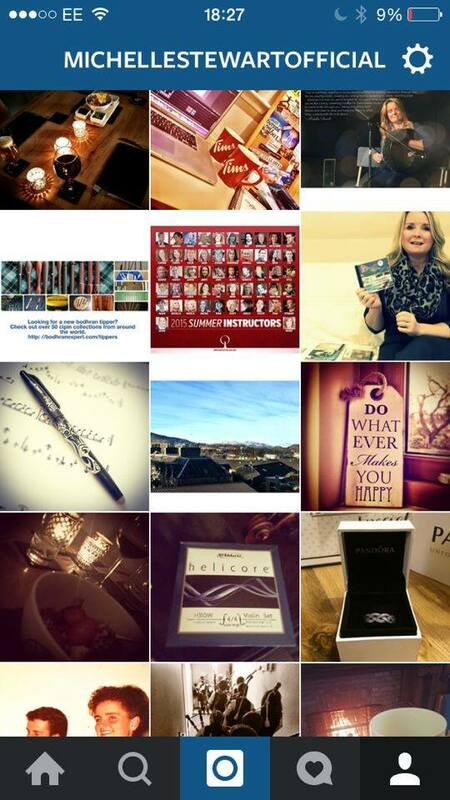 Thanks to everyone who shared their favourite slip tracks with me on social media. Your contributions make up a good part of this list. The first tune, The Kesh Jig, is in 6/8 time. The 9/8 (slip) jig, Give Us A Drink Of Water, starts at the 1:50 minute mark of the track. 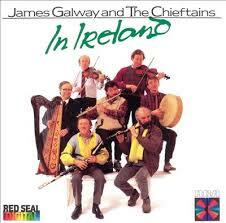 At 2:56 minutes they then change into reel time for the last tune, The Famous Ballymote. 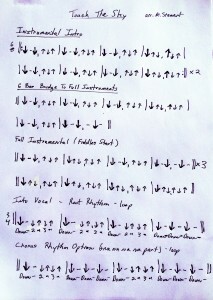 The first two tunes are in 6/8 jig time. Give Us A Drink Of Water (9/8) starts at the 2:25 minute mark. The Swaggering Jig, in 9/8 time, doesn’t start until the 3:13 minute mark of the track. 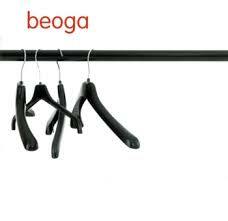 The previous three jigs are in 6/8 time. All three tunes are in 9/8 time. The first tune is in 9/8 time, but also has an extra beat thrown in every once in a while. Simply add an extra three 8th notes/quavers at the end of Part 1 the first three times through and on Part 2 the third time through the tune. The second tune switches into 6/8 and starts at 1:55 min. The first jig, Gingerhog’s No. 2, is in 9/8 time with Double Rise changing to 6/8 time at 1:05 minutes. The third tune, Crossing The Mince, is in 6/8, and starts at 2:08 mins. The last tune, Give Us A Drink Of Water, is in 9/8 time and starts at 3:11 mins. Chloe’s Passion is a great 9/8 jig. The 6/8 jig, The Snuff Wife, starts at the 1:43 minute mark. The last tune, Merrily Danced The Quaker’s Wife, is actually at 12/8 (slide) jig and starts at 2:39 mins. The Full Booner set starts out in 9/8 time, but pleasantly surprises by switching to 5/4 time (aka 10/8) at 1:57 mins. Leppadumdowledum (Port Lúascaigh) is a brilliant 9/8 jig that’s easy to get lost in. 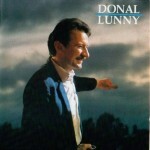 I first heard it from Donal Lunny (below), but enjoy Bully’s Acre version as well. The first tune, I Have A House With A Chimney On Top Of It, is a slip jig. Faith Aaliyah is in 6/8 and 9/8 time and starts at the 1:37 minute mark (after a 4 bar 6/8 bridge). Chrissy plays around with the timing of this second tune by only playing 15 beats of 6/8 time in Part 1 before repeating (instead of the typical 16 beats/8 bars of jig). Then she breaks into 9/8 time for Part 2, but changes the last bar to 6/8 time. She doesn’t repeat Part 2, but goes directly back to playing Part 1 twice more and then Part 2 once more. The third tune, Skylark’s Ascension Jig, starts at 2:26 mins and is in 6/8 time. Bad Day At The Beach – The first tune, Sunburn, Man-flu and The S#!+s, starts at 0:16 mins and is in 9/8 time. They break into reel time at 1:54 mins and continue with reels until the end of the track. D Jigs – The first three tunes are all 6/8 jigs, but the last tune, Ellen O’Grady, is a slip jig. It start at the 3:21 minute mark. The entire track is in 9/8 time. 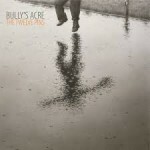 This is perhaps my favourite album of all time. 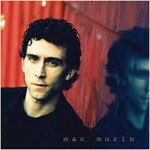 I have the original cd, but I couldn’t find it on iTunes or anywhere online for you to purchase the track. 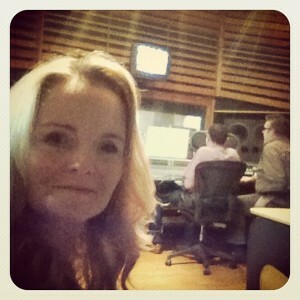 The above link is a YouTube video of the recording. If anyone knows where this can be purchased please let me know so I can add the link here. This is a very pretty track that stays in 9/8 jig time throughout and it’s not too fast either. Starts in 9/8 time, but switches to 6/8 time at the 2:05 minute mark until the end. Starts out with The Butterfly in 9/8 jig time until changing into an unknown 6/8 jig, (or possibly a 12/8 jig) at 2:41mins, before switching back to The Butterfly in 9/8 time at 5:06 mins. Starts in 9/8 time with The Butterfly, but breaks into reels at the 1:20 minute mark and continues in reel time until the end. This track is really clever and a buffet to the ears. 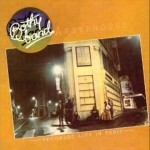 It starts out with the song Sheffield Park in 5/4 time, but what’s really special about it is that when they break into Polly’s Bishop’s Slip Jig at 3:47 mins the backing percussion and bass stay playing 5/4 time. It’s not until they head into Roger De Coverly at 6:01 mins that they backing support comes over to a more slip jig accompaniment. The entire track entitled ‘Slip Jig/ Jig Gan Aimn’ is actually played in 6/8 time. The ‘Slip Jig / The Humours Of Glendart’ track starts out in 9/8 time, but switches to 6/8 at 0:52 and stays in 6/8 for the remainder of the track. 0:00 mins – Starts out in 9/8 time. 2:25 mins – Switch to 9/8 time (Back in to 9/8 time at 2:25 minutes for the next vocal part. 2:33 mins – Switch to 6/8 time (At 2:33 mins, on the words ‘. . . Rattlin’ Roarin’ Willie you’re welcome home to me’, they break into 6/8 time for just a few seconds. 3:21 mins – Switch to 6/8 time and stay there (The last time they sing ‘ . . . Rattlin’ Roarin’ Willie you’re welcome home to me’ they switch to 6/8 time and stay in that time signature for the remainder of the track. 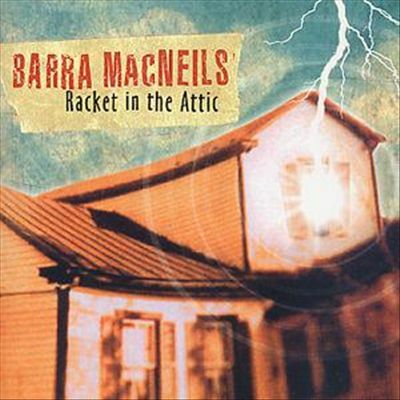 The Barra MacNeils also did this tune on one of their earlier albums ‘Rock In The Stream’, but the timings above are taken from their Racket In The Attic version. It would be impossible to include absolutely every slip jig track here, but please feel free to leave a comment below to share a slip jig track you like. 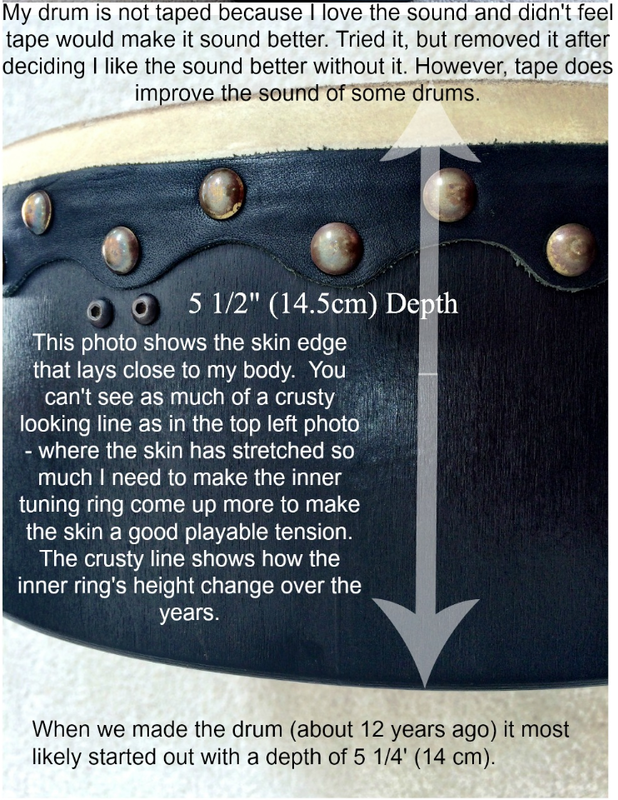 I get asked about my bodhran a lot so I took some time to measure it, take a few photos and add some detailed notes. 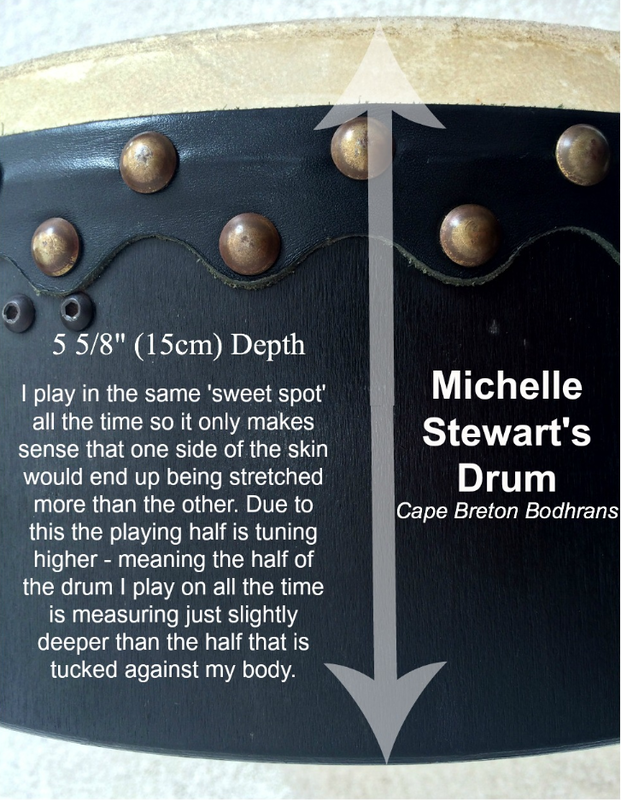 As you read on you’ll see how I even learned something new about my drum just in measuring it for this article. My intention was to try to answer the most common questions I get asked and to simply help and share from my experience. It’s not to say anyone looking to purchase a new drum should try to go by these exact measurements. 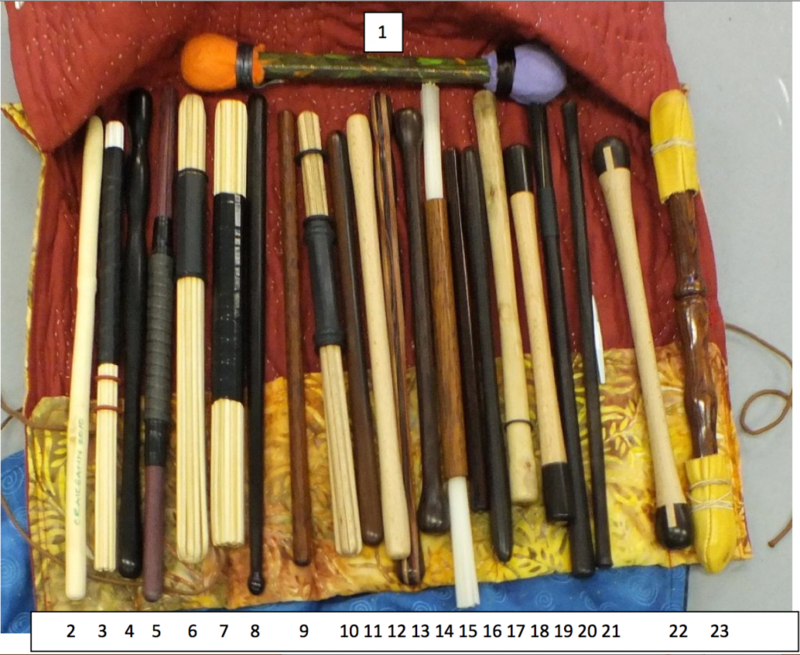 Although most people who try my drum find it quite comfortable I have only included measurements here as a guideline. When I first went from an 18″ drum to just under 15″ I would get extra (unintentional) rim shots because I was used to working with a larger playing surface and extending my tipper arm further out. It took a while to adjust to the smaller size, but I’d never go back to regularly playing an 18″ drum. Now I personally prefer this smaller size because it’s what I’m used to. My next drum will most likely be a 14″ diameter bodhran, mainly due to the tonal opportunities it can offer, but also partly due to the fact that I already have a drum of the 15″ family. It is difficult to get as wide of a range of tonal changes out of an 18″ drum as you can out of a 15″ drum. For this reason I would suggest going smaller if you currently have an 18″ drum and looking to upgrade and want more notes to work with. The 14″ – 16″ diameter range suits most people. 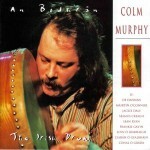 Your choice of drum isn’t determined by your general physical body size, but if you are a larger-breasted female or a man with very large hands you may find a 14″ diameter bodhran too restrictive. The 15″ – 16″ range would probably be more comfortable. I know an inch in the difference doesn’t sound like it would give you that much more room, but it really does. I’m 5’3″, and of average size, and now find even a 16″ drum too big for me. 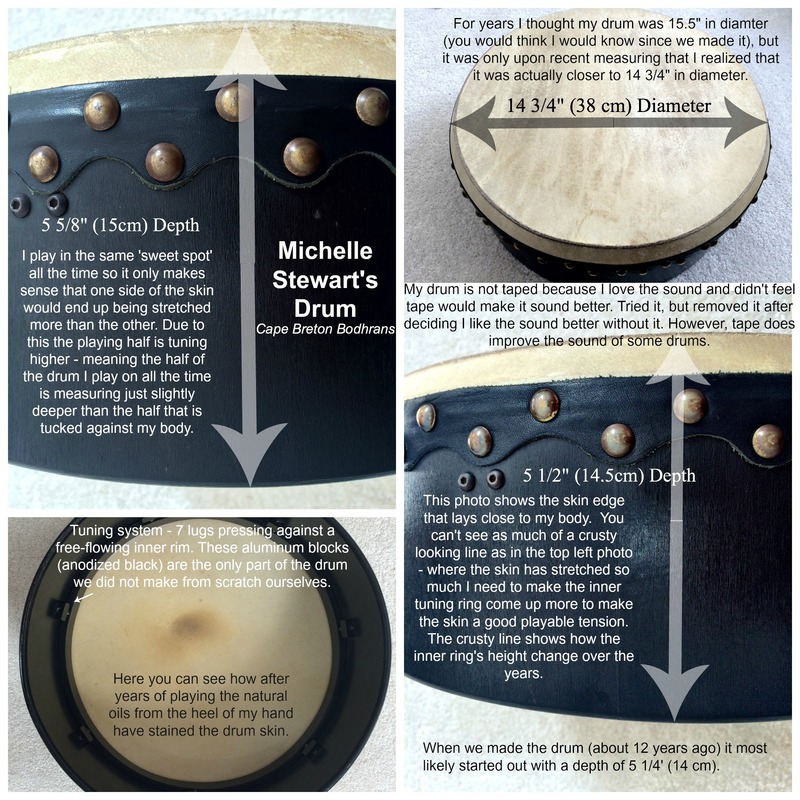 My drum was made by my husband, Mark, and myself. 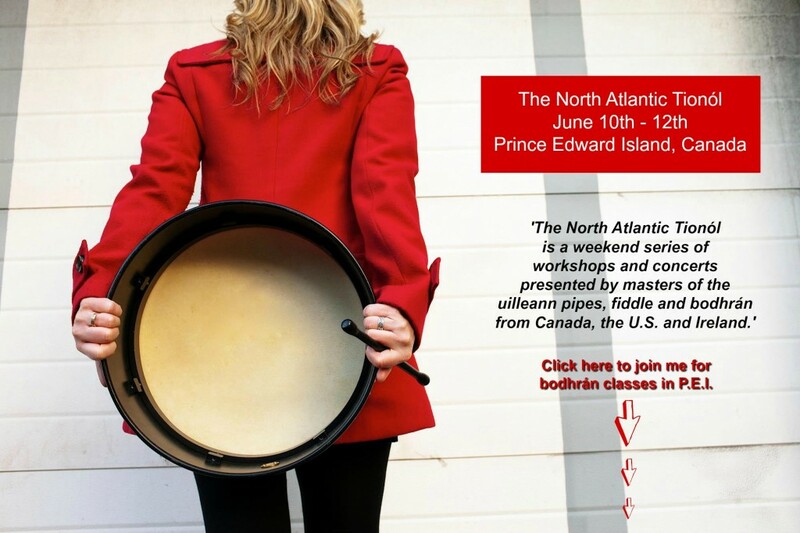 When we lived in Canada in the ’90’s we had a successful drum making business, Cape Breton Bodhrans. We even had an apprentice working with us at one point. We moved back to Scotland in 2001 and set up a small workshop. This drum, the one I play in my videos, was one of the first drums we made in it. However, we’ve since knocked down our workshop and old house to build new houses on the same plot of land. Although we’re now in our new house, and plan to set up a small workshop in the future, we expect it will be more for our own personal use rather than commercial production. I play in the same ‘sweet spot’ all the time so it only makes sense that one side of the skin would end up being stretched more than the other. 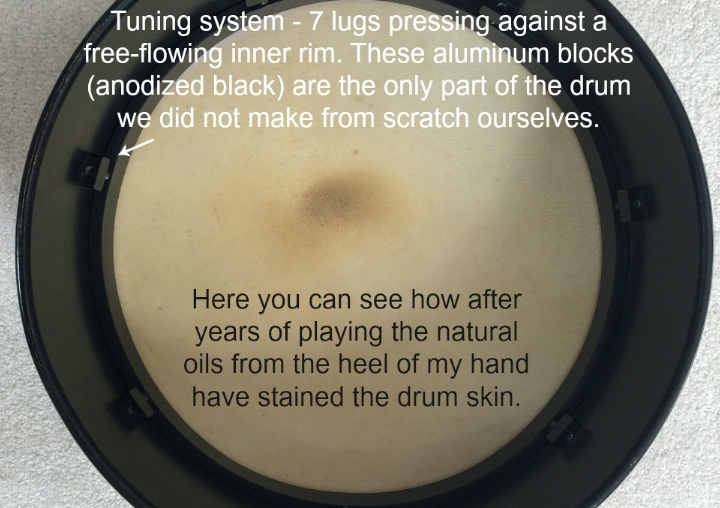 Due to this the playing half is tuning higher – meaning the half of the drum I play on all the time is measuring just slightly deeper than the half that is tucked against my body. This playing section of the goatskin has lost more of its natural elasticity than the other half of the skin. I know, you’re probably thinking ‘Couldn’t you just adjust the tuning so both sides were even?’. Yes I could, but it doesn’t sound in tune with itself when I do that due to the difference in skin elasticity of each half of the drum head. What you have to realise though is that this is an extreme case. 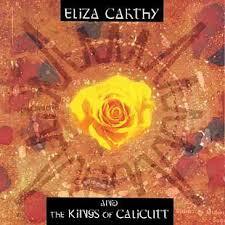 I play my bodhran more in a summer than most people will play their drum in a lifetime. Some days I may be teaching, performing, and playing my drum up to 7 or 8 hours A DAY! As the skin was stretched more on one half than the other through playing the inner tuning ring needed to come up more on one side merely to help the more stretched side come up to the same tension as the other and make the skin a good playable tension. The crusty line on the skin edge shows how the inner ring’s height changed over the years. It reminds me of how rings on a tree trunk show how old it is. Another thing to remember is that working with an animal skin is quite different from working with a man-made product. More transparent areas of the drum head are thinner than the less transparent sections. You can see this more clearly if you hold you drum up to the light of a window. When we made this drum (about 12 years ago) it most likely started out with a depth of 5 1/4″ (14 cm). It took me a while to get used to the smaller diameter, deeper shell and no crossbar, but this change was a good one. I wouldn’t recommend going any deeper than my drum. A depth closer to 6″ is really too deep for my liking. It’s difficult to get your arm around and as a result awkward to get any back hand pressure or movement to change tones. Teaching hundreds of people in person over the last two and a half decades, and having them try various sized drums, gives me the confidence to guide you on this. The tuning mechanism consists of 7 lugs pressing against a free-flowing, wooden inner rim. These aluminium blocks (anodised black) are the only part of the drum we did not make from scratch ourselves. The skin is goatskin and super soft after years of excessive use. In the photo you can see how after years of playing the natural oils from the heel of my hand have stained the drum skin. Up close the darkened spot is quite shiny and looks as if I’ve poured extra virgin olive oil on to it, but it’s just the natural oils from my hand. 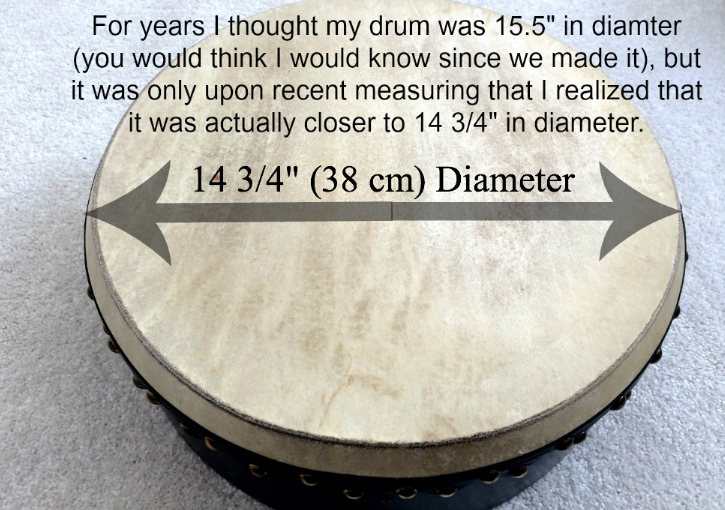 For years I thought my drum was 15.5″ in diameter (you would think I would remember since we made it), but it was only upon recent measuring that I realised it was actually closer to 14 3/4″ in diameter. My drum is not taped. Tried it, but removed it after deciding I liked the sound better without it. However, tape does improve the sound of some drums. It can even offer a nice ‘slappy’ sound for those offbeat pops. I enjoy playing other people’s drums that are taped so don’t be swayed by my drum. In fact, it’s likely my next drum will have tape on it. The photo below shows the skin edge that lays close to my body. You can’t see as much of a crusty looking line as in the playing side photo and the depth is a bit less than the playing side depth. The brass tacks were longer than the depth of the shell so all 56 of them had to be individually snipped and then filed down on one side to make a sharp point. The skin was stapled and glued to the frame under the black, scalloped leather finishing band. These finishing touches alone were quite time consuming so when you look at the price of drums and think they are expensive think of how much time has gone in to making them. 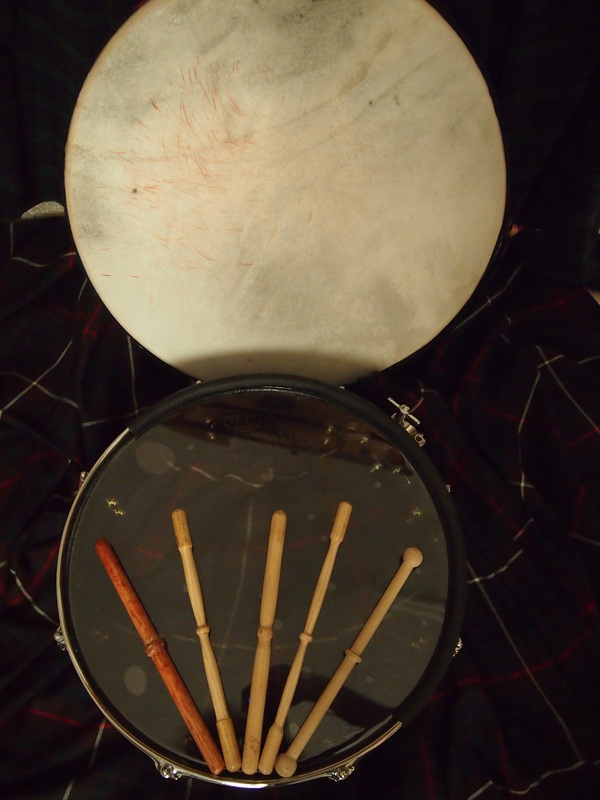 If my memory serves me right my drum took approximately 40 hours to make. I hope this article helps anyone looking to upgrade to a new drum. I really hesitate from suggesting any one particular maker because I think there are a lot of amazing makers out there today. It wouldn’t be right to direct all the traffic to just one – and I wouldn’t be able to pick anyway. 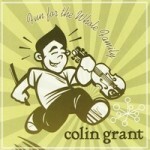 Be sure to check out my ‘Bodhran Makers Of The World’ list. Here you’ll find makers categorised by county and direct links to their websites. You will love your drum so much more knowing that you’ve done the research to find the drum that best suits you. It’s ok for us to all have different preferences. PLATINUM CLASS OF 2016 is COMING SOON! If you’ve been on the waiting list for my next BodhranExpert Platinum Membership class you won’t have to wait much longer. 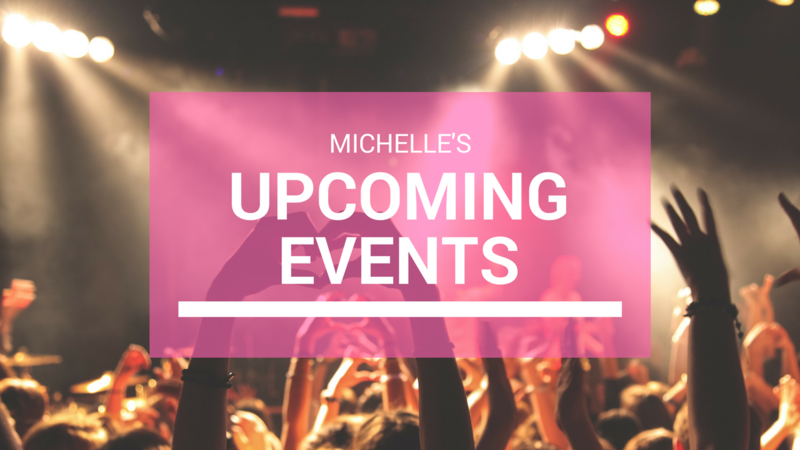 If you’re not already on the VIP waiting list and don’t want to miss out this time round click this link and you’ll get notice of when the program launches. 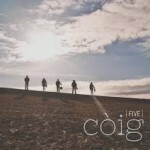 I recently had the privilege to witness some great Celtic music getting recorded from behind the scenes at the top ‘go-to’ studio in Scotland, Castlesound Studios. As if that wasn’t enough I also got to meet one of my percussion heros, Jim Sutherland. I tried to act all cool, but inside I was thinking of all amazing rhythms I learned from him while listening to Gordon Duncan and Dougie MacLean albums over the years. I mean this guy is a legend. 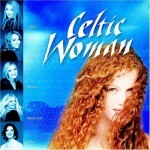 He even taught Evelyn Glennie how to play bodhran. Jim and his crew were really friendly and made me feel very welcome. He was going to even have me participate on one of the tracks, but unfortunately the studio was a three-hour round trip for me and I had to get home to collect my son from after-school club. Honestly though, I was just so chuffed to meet Jim because he has been a big influence on my drumming. What I could do though was scribble down some very simple patterns to get you started. Clicking on the arrow notation image below will enlarge it. You can play along to the YouTube video here, but the link for buying ‘Touch The Sky’ on iTunes is right below it. I hope you like this track. Playing along to it is like taking a happy pill. ps. 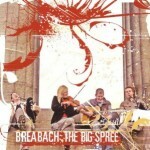 Struileag – Shore To Shore was the recording project Jim was working on at Castlesound. BodhranExpert Platinum Membership is now LIVE! I wanted you, my bodhran family, to be the first to know that I have a book coming out and a new website MichelleStewart.com launching soon. Feel free to head over to http://www.michellestewart.com/hot-mama-in-high-heels/ for a sneak peek.